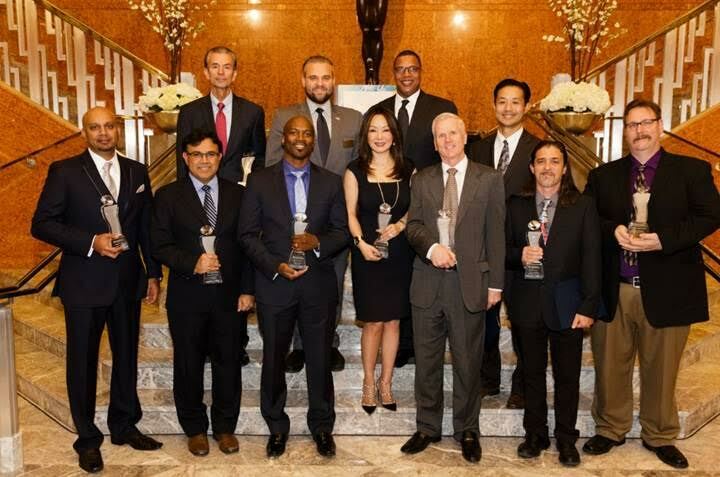 VEGAS INC and Title Sponsor Cox Business highlighted Southern Nevada’s greatest technical achievements at its fifth annual Top Tech Exec Awards at The Smith Center for the Performing Arts on Thursday, November 19, 2015. During the event, guests enjoyed complimentary drinks, appetizers and desserts catered by Four Seasons Las Vegas as award winners were announced and honored by the evening’s emcee and Greenspun Media Group’s publisher, Gordon Prouty. Prouty was joined on stage throughout the evening by title sponsor Cox Business representatives Vice President Derrick Hill and Jeff Breaux, vice president of field operations for the west region. Many of the award winners delivered speeches accepting the awards and thanking those that contributed to their successes as the city’s preeminent technology executives. Ken Minster, a representative from Congressman Joe Heck’s office, also presented each award recipient with a certificate of achievement signed by Congressman Heck. Winners were determined by an independent panel of judges and were recognized in ten categories at the ceremony. Selections were based on factors such as recent achievements, impact on his or her company, major projects and more. Dr. Kate Zhong, senior director of clinical research of the Cleveland Clinic Lou Ruvo Center for Brain Health, in the category of Health. Honorees were featured in the Sunday, November 22, 2015 issue of VEGAS INC.
Bob Schaich was also honored with a Lifetime Achievement Award for his work with UnitedHealthcare of Nevada. As senior vice president and chief information officer, Schaich has spent years leading teams that implemented e-commerce in the health care industry, electronic medical records systems and has also overseen numerous clinical and managed care automation efforts. Schaich started with Sierra Health Services in 1999, and stayed on with UHC after the national health care provider bought Sierra in 2008. He oversees about 100 people in Nevada for UHC, but his team’s reach extends far beyond the Silver State. It has completed projects for UHC in Utah, Arizona, Illinois, Wisconsin and Georgia. About Vegas Inc: Vegas Inc is a weekly business-to-business publication geared for professionals. Each week, readers are enticed with a 360-degree approach to business coverage as Vegas Inc explores the city’s most pressing topics ranging from gaming, tourism, finance, entertainment and real estate to health care, dining and social media. Regular weekly features include in-depth stories, interviews and profiles displayed through a well-written, eye-catching format. Vegas Inc is available on Sundays inside The Sunday, and standalone copies are available on Mondays with a purchase of a one-year subscription for $90.